Spiegel & Grau, 9780385521710, 512pp. Not since Thomas L. Friedman’s groundbreaking From Beirut to Jerusalem has a book captured the essence and the beating heart of the Middle East as keenly and dynamically as My Promised Land. Facing unprecedented internal and external pressures, Israel today is at a moment of existential crisis. 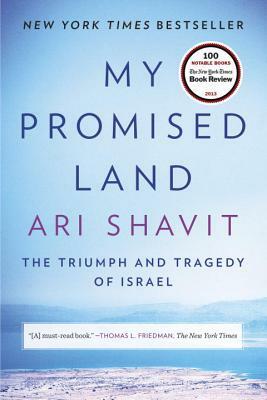 Ari Shavit draws on interviews, historical documents, private diaries, and letters, as well as his own family’s story, illuminating the pivotal moments of the Zionist century to tell a riveting narrative that is larger than the sum of its parts: both personal and national, both deeply human and of profound historical dimension. We meet Shavit’s great-grandfather, a British Zionist who in 1897 visited the Holy Land on a Thomas Cook tour and understood that it was the way of the future for his people; the idealist young farmer who bought land from his Arab neighbor in the 1920s to grow the Jaffa oranges that would create Palestine’s booming economy; the visionary youth group leader who, in the 1940s, transformed Masada from the neglected ruins of an extremist sect into a powerful symbol for Zionism; the Palestinian who as a young man in 1948 was driven with his family from his home during the expulsion from Lydda; the immigrant orphans of Europe’s Holocaust, who took on menial work and focused on raising their children to become the leaders of the new state; the pragmatic engineer who was instrumental in developing Israel’s nuclear program in the 1960s, in the only interview he ever gave; the zealous religious Zionists who started the settler movement in the 1970s; the dot-com entrepreneurs and young men and women behind Tel-Aviv’s booming club scene; and today’s architects of Israel’s foreign policy with Iran, whose nuclear threat looms ominously over the tiny country. As it examines the complexities and contradictions of the Israeli condition, My Promised Land asks difficult but important questions: Why did Israel come to be? How did it come to be? Can Israel survive? Culminating with an analysis of the issues and threats that Israel is currently facing, My Promised Land uses the defining events of the past to shed new light on the present. The result is a landmark portrait of a small, vibrant country living on the edge, whose identity and presence play a crucial role in today’s global political landscape. Ari Shavit is a leading Israeli journalist, a columnist for Haaretz, and a commentator on Israeli public television.